Chinese New Year in 2018 is on Friday, the 16th of February. Chinese tradition gives the Chinese a 12-year animal zodiac cycle. 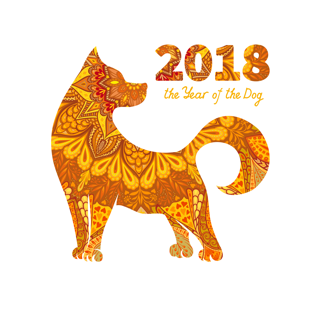 The Chinese year beginning in 2018 is the year of the Dog. The animal of 2018 is the Yang Male Earth Dog. Brown is connected to Earth. Therefore, 2018 is also called Brown Earth Dog Year. Chinese philosophy says that Dog years might have some health challenges. Dog year people need to be careful not to get injuries to their arms and legs. Also Dog year people need to pay attention to their respiratory system. Suggestions for Dog year people to help themselves remain calm is to take relaxing walks in parks or lakeside areas. But overall speaking, ‘dogs’ enjoy good health for they are happy most of the time. Dogs are active doing sports, so they have a resilience to fight illness, such as colds, coughs, and fever. Often they get involved with heavy work and frequent social activities. These things plus the exercise they are often involved with means they need to pay attention to getting enough rest. Plenty of rest will benefit them both physically and mentally. Often times dogs are not obsessed about seeking for money and power, so they often times feel less stressed and tense at work and in life than some people. 2018 is Male Earth Dog. Male Earth is connected to dry soil, walls, mound or mountains. The sign of 2018 Earth Dog is mountains over mountains. 2018 will be a very strong Earth. This implies the events related to land, real estate, county territory, agriculture, earthquake, mineral and the Earth will be more active than some other years. The ‘mountain of 2018’ appearing in the front of us means something is blocking our view, or our path. That’s a sign of an obstacle. We need to climb over the mountain to see beyond. Or else we need to find a flat road around the mountains to find our way. Either way, we need to take extra effort to reach our destination, and our goals. 2018 could end up being a challenge year for many people. We need to use our wisdom to find the better way to conquer the mountains/ie our challenges. If we can do that, then we will be ahead of many others. If we cannot, then we will behind the world. The ‘mountains of 2018’ are related to stability, slowness, stubborn and laziness. If we are too lazy and lack being diligent of spirit, then we might miss career, or money, opportunities. Whether we follow all the thinking of the Chinese and their traditions of every year being the ‘year of some animal’, it can be interesting to read what the Chinese beliefs are, particularly since we are working with Traditional Chinese Medicine. Give our office a call for an appointment today.